If your item is in stock, your order is estimated to ship on the next business day. Delivery will depend on your destination. Free shipping offer on cart value above HK$599 applies for orders fulfilled and shipped by RazerStore excluding bulk orders, gift redemptions and oversized items. Offer applies to shipping fees and does not include customs and handling fees where applicable. Offer is subject to change without notice. Delivery will take 2 to 10 business days after the order has shipped. 2. 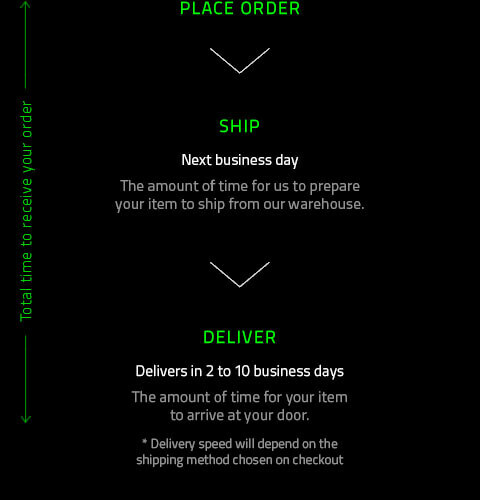 Go to “Delivery Method” to view your shipment delivery information. 3. If your order has shipped, you will see and this links to your shipment delivery details including the estimated order delivery date.